Even though I live near the coast, I still think that there is something special about a seafood dinner. As we get closer to the holidays, many people in my area of southeast Georgia will gather around fires in their backyards to prepare Low Country boils and oyster roasts ~ boiled shrimp and steamed oysters. I'll take mine slathered in homemade cocktail sauce, please. I am comfortable cooking certain types of seafood such as shrimp, scallops, oysters, and a small variety of fish. But, there is a whole world (or ocean) of seafood out there that still remains a mystery to me. 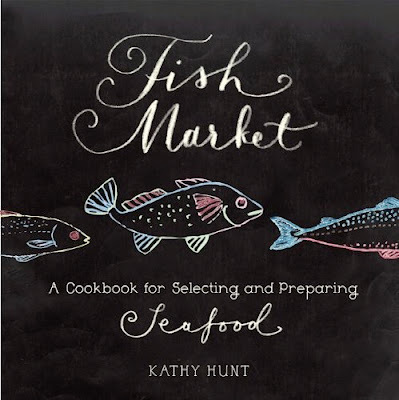 If you're like me and need more guidance on preparing seafood, then you need Fish Market: A Cookbook for Selecting and Preparing Seafood by Kathy Hunt. This cookbook is a comprehensive guide to all types of seafood and is an invaluable resource for all home cook who wish to become more confident in preparing seafood. The cookbook begins with the author discussing the merits of incorporating seafood into your diet. She then tells readers two of the most important things to remember when cooking seafood: keep the preparations simple and don't overcook it. She teaches readers how to select seafood by look, touch, and smell. I know that I've spent long periods of time in front of the seafood case at my local grocery store trying to decide if a piece of fish was worth buying and eating. Finally, the author includes a tutorial on cleaning and preparing whole fish if you should ever find yourself in possession of one. Each chapter includes several recipes for each specific seafood listed in the contents. While each recipe features a specific type of seafood that may or may not be readily available in your area, the rest of the ingredients are fairly common and easily attainable. The directions are uncomplicated continuing the "keep it simple" theme running throughout the book. Recipes are introduced with regional background information, menu suggestions, and helpful tips on preparation. I chose to test the recipe for Pan Seared Scallops with Sherry Vinegar Reduction. Scallops can be a little expensive in our area so when I do splurge on them (or find them on sale), I like to prepare them in a special way. This recipe was delicious! 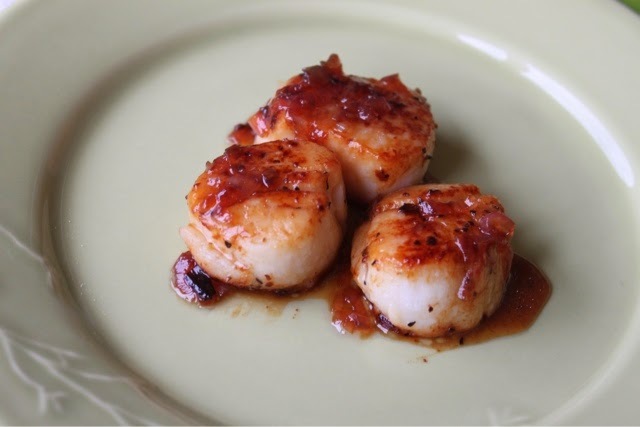 The tangy sweetness of the reduction worked well with the natural buttery sweetness of the scallops. It was definitely a celebration-worthy dish. Fish Market: A Cookbook for Selecting and Preparing Seafood is a cooking resource that I am glad to add to my collection. For more information on this cookbook, visit Fish Market by Kathy Hunt. Disclaimer: The author provided me with a review copy of this cookbook; however, the opinion expressed here is my own.